From the makers of Scentsy Flameless Candles comes Velata, premium Belgian chocolate warmed and served in a fun-to-use warmer – no flame, no scorching, no messy cleanup! 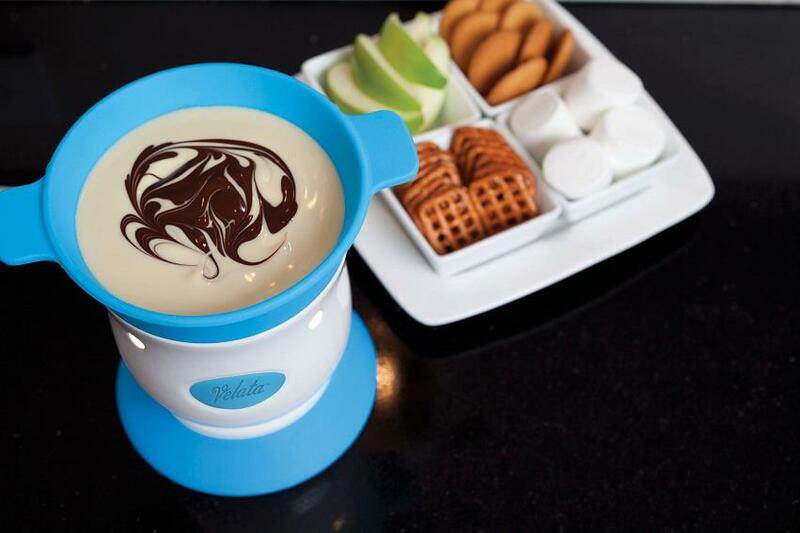 Available in 3 sleek designs and 8 vibrant colors, Velata Fondue Warmers add a hip, fun element to any kitchen counter or dining room table. A simple, 25-watt bulb provides all the heat necessary to keep your chocolate in totally tempting, tip-top shape. The silicone dish can be heated in your microwave and later tossed in the dishwasher. The patent-pending design keeps chocolate at the perfect temperature — not too hot, but warm enough to stay velvety smooth for dipping. Crafted from premium cocoa beans by one of the most prestigious Belgian chocolate companies in the world, Velata Premium Chocolate is designed to melt beautifully and stay at the perfect temperature for dipping. Easy-to-prepare Velata chocolate is available in four delectable, indulgent flavors: caramel milk chocolate, milk chocolate, dark chocolate, and white chocolate. This entry was posted in About Velata and tagged chocolate, chocolate fountain, fondue, gluten free, Scentsy, Velata. Bookmark the permalink.